Talk about one hectic day for the jailbreaking community. Not only did GeoHotz return to the jailbreaking scene with the bang, he gave the middle finger to the Dev-Team at the same time. There is a lot of controversy going around the web, about why GeoHotz has returned and why he released LimeRa1n when Chronic-Dev proposed an ETA on GreenPois0n. Apparently GeoHotz wants to save the SHAtter exploit (as it is a better exploit than his), so him releasing LimeRa1n was meant to stop Chronic-Dev from releasing GreenPoison (or make them change their exploit). As Chronic-Dev now needs to implement GeoHotz exploit into GreenPois0n it could affect its ETA, but hey we have LimeRa1n…. Now before we begin the tutorial it is important to note that LimeRa1n is buggy, and unstable. Users who have used LimeRa1n have experienced a wide range of errors, so we recommend that you try this at your own risk. If you feel the need to, LimeRain supports the following iPhone, iPod Touch, iPad’s running the iOS 4 to iOS 4.1 firmware (iOS 3.2.2 for iPad). If you have one of the iDevices listed you can jailbreak your iDevice, by following the tutorial below. Note: if you require an unlock DO NOT update to the iOS 4.1 firmware, you will need to wait for the PwnageTool to be released. Step 1) The first thing you will need to do is download LimeRa1n to your desktop. Step 2) Now make sure your iPhone, iPod Touch, iPad is running a stock firmware file (a firmware file that is not Beta). If you are running a stock firmware file, also ensure you do not need an unlock if you plan on jailbreaking iOS 4.1. Upgrading to the iOS 4.1 firmware will result in not being able to unlock your iPhone (possibly forever…you have been warned). If you have made it to here, the next thing you will need to do is Double Click on the LimeRa1n.exe icon to launch LimeRa1n. Once LimeRa1n is up and running you will need to click the Make it Ra1n button. Once you click the Make it Ra1n button your iDevice should enter Recovery Mode. Step 3) The next thing you will need to do is put your iDevice into DFU mode. To do so follow the instructions presented to you by LimeRa1n. You will first need to press the Home and Power buttons together. Then; once prompted by LimeRan, release the power button. Once you release the power button, continue holding the home button until your iDevice enters DFU mode. Step 4) If done correctly, an image of a LimeRain drop should be displayed on your iDevice. Wait a few minutes for the jailbreak process to complete. When the jailbreak process has complete, LimeRain will notify you accordingly. Step 5) Now you are near completing your jailbreak. The next thing you will need to do is grab your iDevice (once it reboots, of course) and load up the new icon on your homescreen called LimeRa1n. 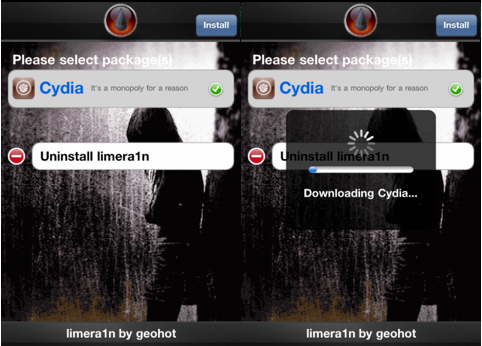 Once the LimeRa1n.app is up and running you will need to select Cydia and click the install button. As depicted to you below. Your iPhone, iPod Touch, iPad should respring and Cydia should be on your SpringBoard. If it is not you will need to simply restart your iPhone, iPod Touch, iPad. Congratulations! will it jailbreak ios 4.0.1?? Hello guys, yes this will jailbreak all firmware from iOS4 all the way to iOS4.1. As long as you do not physically update to iOS4.1, you will still be able to unlock. LimeRa1n does not update your firmware when jailbreaking. However, if for some reason something goes wrong ensure that you restore back to iOS4.0.1 and not iOS4.1, as this will leave you unable to unlock. just upgraded my 3gs with new bootrom from a jailbroken 4.0.1 to 4.1 and jailbroke with limera1n. seems to have worked, still installing cydia apps, but no need to reinstall all my apps are there still! whew! I have an old 3GS I’m looking to jailbreak/unlock and sell. I know this tool only jailbreaks and that I can’t update to 4.1 to unlock it, so what tools can I use on iOS4 or iOS4.0.1 to unlock the phone after I jailbreak it? what about 4.0.2???? I have an iphone 4 with 4.0.2 and want to jailbreak and unlock. Can I use limera1n to jailbreak and be able to unlock?? if so, how do i unlock? please help! thanks. Will Pawnage tool work with a windows pc ? I need a tool that can jailbreak ip4, with 4.1, and still be able to unlock..
No it doesn’t work on PC unfortunately, you would either need to use VM ware to emulate Mac or wait for a windows alternative. Tried GP many times without success, but LimeRa1n work like a wonder on the second try. Many thanks Geohot. Keep up your good work. well, iPod doesn’t work at all. how will I do this?